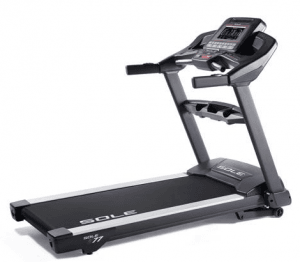 It is not common for treadmill manufacturers to make two treadmills of similar specifications and prices but two of the top SOLE treadmills are similar enough to make a fair comparison. These two treadmills are the SOLE S77 and the SOLE F85. They are two of the top treadmills from the SOLE treadmill line. As you can see, visually, there is little to differentiate between these two treadmills. Beyond the visual similarities, there are many other ways these two treadmills are alike, which is why it can be hard to choose between these two treadmills. To help you decide between these excellent treadmills, Treadmill Reviews has created an in-depth comparison so you can see exactly which one is the right SOLE treadmill for you. Cost – Price range-wise, both treadmills fall into the treadmills under $2,000 category. However, the S77 is generally $100 less than the F85. Weight Capacity – These treadmills have the exact same weight capacity, which is 400 lbs. SOLE treadmills generally have the highest weight capacity of all residential treadmills. 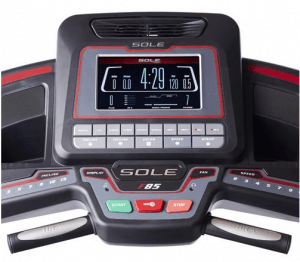 Available Programs – Like all SOLE treadmills, both the S77 and the F85 come with 8 pre-built exercise programs and 2 spots for users to create their own workout programs. Both treadmills have identical programs. Dimensions – The S77 measures 58″ in height, 82″ long, and 36″ wide while the F85 measures 57″ in height, 83″ long, and 37″ wide. These measurements are very close, yet the S77 is slightly smaller in width and length. Running Surface – Both of these treadmills have 22” wide by 60” long treadmill belts, with a thickness which is 2-ply. 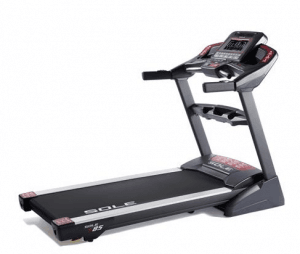 Folding – The F85 can fold up while the S77 is one of the few SOLE treadmills which cannot fold. Motor Size – There are motors of identical size in these two treadmills, which are 4.0 CHP in size. Incline Range – Identical incline ranges of 0% to 15% are on both the S77 and F85. Speed – Both of these treadmills max out at 12 MPH, which is standard for many residential treadmills. Fans – Two small, single-speed fans are found on top of the consoles of both the S77 and the F85. While the angle of the fan can be adjusted, both of these treadmills have weak fans. Heart Rate Monitoring – The S77 and F85 both have heart rate measuring handlebars. While these handlebars are not very accurate, these treadmills also come with Bluetooth-enabled, adjustable heart rate chest straps. The straps can deliver highly accurate heart rate tracking. Treadmill Weight – While the S77 and F85 have many identical features, the S77 is lighter than the F85 by 43 lbs. Materials – For the most part, these two treadmills seem to have the same materials used in their construction. All the materials are high-quality, such as the commercial-gauge steel frame and the minimal use of thick molded plastic. However, the hydraulic system on the F85 adds a layer of superiority. It allows users to more easily fold up the deck of the F85 and users can allow the deck to lower itself hands-free. As the S77 cannot fold, it lacks this helpful addition. Sturdiness – While we tested both treadmills, the F85 performed better under the running at incline tests we put it through. The S77 had a slight tendency to wobble a bit when operating at a higher incline as the tester ran. Moving the treadmill – Both of these treadmills are heavy, which makes the task of moving them difficult. However, the F85 can fold up and be rolled fairly easily while the S77 does not fold, making it tough to maneuver the treadmill, especially if you need to move the S77 through a doorway. Cushioning – These treadmills both come with Cushion Whisper Flex™ treadmill decks. However, the F85 has a slightly more flexible deck, which can be easier on sensitive feet. Assembly – As these two treadmills are constructed with many of the same materials, they take around the same amount of time to assemble. Speed and Incline Controls – The speed and incline controls on the S77 and F85 are identical to each other, as you can see from their pictures above. Both sets of controls do not display all the possible inclines and speeds. 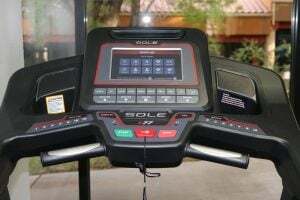 However, you can use the manual adjustment buttons located near the console displays or the speed and incline adjustment buttons on the arms of both of these treadmills. Fan Controls – Responsive to your touch, the fan control for both of these treadmills is located on the right-hand side of the treadmill console, directly below the main program buttons. Program Selection – The same programs are available on both of these treadmills. Users can express their creativity with the two users custom program slots, but otherwise, these treadmills are exactly the same in this aspect. 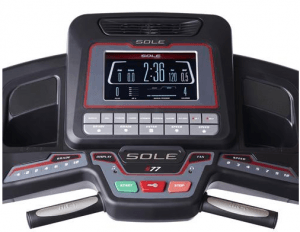 Visual Display – Both treadmills have 10.1” TFT LCD console displays and from what you can see in the pictures above, the only real way to distinguish a difference between the two console displays is the small “S77” or “F85” located under the SOLE logo. Speakers – The sound quality on both of these treadmills is the same decent range. Crisp sound quality until you reach the higher sound levels but both speakers have weak bass. USB Port – Neither treadmill has a USB port. 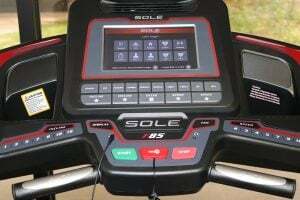 Other Entertainment Features – SOLE treadmills are not known for their entertainment and the S77 and F85 are no exception. Data Display – To a certain extent, everyone uses the data tracking on a treadmill, even if all they want to know is when they can stop working out. As the S77 and the F85 are two of the best SOLE treadmills, they offer more workout information than other SOLE treadmills. Fitness Apps – Both of these treadmills can sync with the SOLE Fitness app, which allows you to more easily control your treadmill and create custom workouts. You can also use the app to save your workout data. Affirm – secondary financing, there is none available through SOLE directly. Rates vary from 10 to 30% APR. For a $1399.99 purchase, you can expect to pay about $123.08 per month for 12 months at 10% APR. This seems like a good way to go if you’re financing the purchase. The monthly fees and interest applied to the purchase are all very upfront. However, assume there are major penalties for late payments like with most credit card purchases. Lifetime warranty on motor, deck, and frame; 5 years for parts; 2 years for labor. The warranty extends only to the original purchaser and will need to be registered. Owners will need to fill out a form to request service or parts. It was a close race and the F85 only beat the S77 in 5 categories while they tied in 19 of the 27 categories we used to compare them. So, if you end up preferring the S77 to our pick of the F85, you can feel assured that the S77 is very similar to the winning treadmill. No matter which one you choose to purchase, be sure to use our exclusive treadmill coupons to make your treadmill buying process just a little easier.